Moshe, we can never truly thank-you for all you did for us in Israel. The Estrogen Tour was a phenomenal success, a blast, a great memory now. We owe all of it to you and Ohad and your family! Wow!!!!!! what a fantastic trip I will be talking about it for a life time. We did so many fantastic things. I really thought the topography of Israel was remarkable. Traveling from the middle to the South and then the North gave such a broad view of your beautiful safe country. Some of the highlights for me was visiting the Holy city of Jerusalem, especially the Garden of Gethsemane and The Church of Agony. Sailing on the Sea of Galilee at sunset, beautiful!!! The archaeological dig and going Spelunking, I never thought I would do that, but I made it and I am so happy I did. I also loved the camel ride at the Bedouin camp. That was a very spiritual night when we all sat around the campfire and the area where we got to listen to Susan. I also loved rafting on the Jordan River, Faith lost her hat and the guy got in a raft and retrieved it. 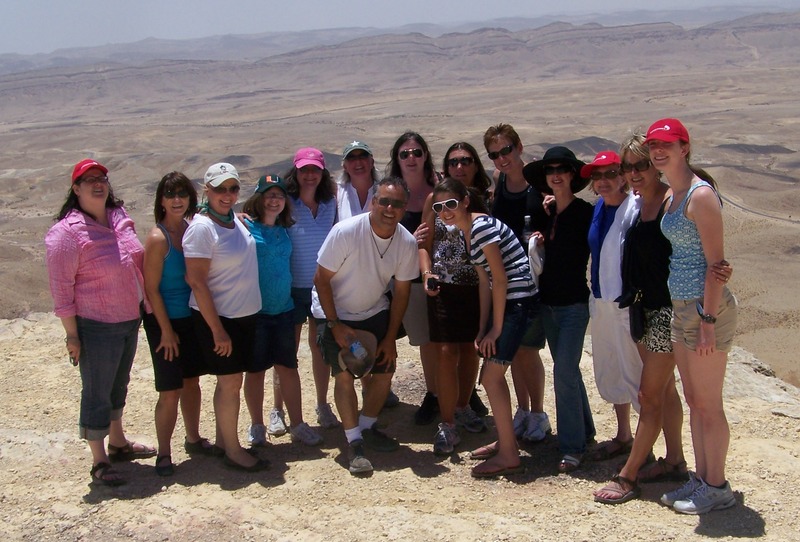 Caesarea was awesome, the winery, learning about the Golan…. Also, the beautiful walk up to the Water falls where Jesus named Simon, Peter. What can I say about the Bat Mitzvah on Massada…. It was also very spiritual, I was so very elated to be a part of special a special event in the lives of Samantha and Tamar. The hotel in Safed was super it had so many levels and such a great view. Food was excellent, in fact the food was excellent everywhere. I am also happy we got to visit Bethlehem, crossing over and seeing the wall made the news on TV come alive. Also…. to plant a sapling and leave it to grow in a mature tree was awesome. I feel like I left a part of me. So many memories to hold in my heart. Best also was spending time with you Moshe and getting to know you, your sense of humor and extreme knowledge of your beautiful country. I learned so much and as I said before the news about Israel comes alive to me now. You were wonderful! The bus we traveled in was sooooooo very comfortable and made it earsier when we were tired to get form point A to point B.
Ohad was such a fantastic bus driver he took such a interest in each one of us and he knew I loved decaf coffee and ice cream, he always and you too made sure I found ice cream. I too appriciate Ohad marking my map that you gave to me. I have shown my family the route we took. I would love to return again and do it again. The very best to you always Moshe and may GOD bless your life with safety and good health so you can continue to do what you do best, TRAVEL with knowledge to impart.